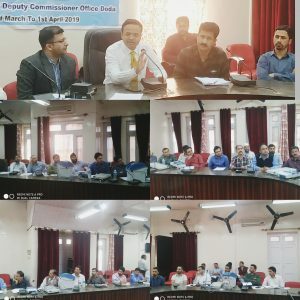 To ensure smooth conduct of General Elections in the district, District Election Officer Doda, Dr Sagar D. Doifode today convened a meeting of Zonal and Sectoral Magistrates deployed for the Polling stations in the district. He further stated that the Magistrate should be well familiar with the location of the polling station, collection centres, route map, sector, transport and communication plans. DEO Doda, briefied the participants regarding the start of the poll, time of first vote cast, besides reporting about any law and order situation asked them to flash reports to his office from time to time. to act as a felicitator during the election process for free and fair and smooth conduct of elections. 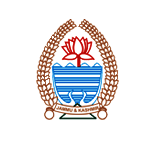 Nodal Officer EVM-VVPAT instructed the magistrates that end-to-end movement of all reserve EVMs and VVPATs shall be carefully monitored at all times, for which vehicles of sector officers, with reserve EVMs and VVPATs, shall be fitted with GPS tracking system. Meeting was followed by detailed training session.During the training session the Master trainers acquainted the Zonal and Sector magistrates about the functioning of Electronic Voting Machines (EVMs) and Voter Verifiable Paper Audit Trail (VVPAT) machines in detail. The trainers explained about the functioning of Ballot Unit, Control Unit and other allied functions and operations of the electronic voting machines. The Sealing of Control Unit and VVPAT was also shown to participants during the training programme. ACD Doda Devender Singh Bhau who is Nodal officer Trainings also attended the meeting.